Subway riders will soon find themselves sitting in new and redesigned subway cars under a new plan to introduce 1,025 updated subway cars by Gov. 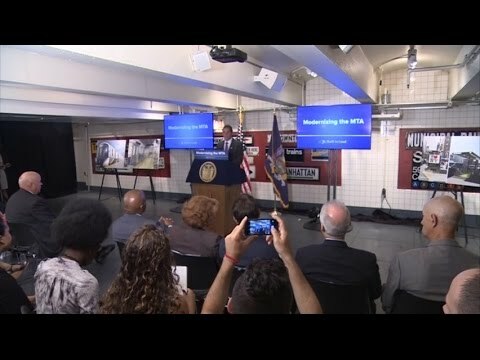 Andrew Cuomo at the Transit Museum in Brooklyn on Tuesday. The plan includes enhancements to the exteriors and interiors of regular cars, wider doors, as well as the addition of up to 750 “open car end” designed-cars, which will reduce wait times and increase capacity. Cuomo also offered a glimpse at the key elements that will be featured in the renovation of 31 subway stations throughout the New York Metropolitan Area. The MTA anticipates that out of 1,025 new cars, up to 750 will feature an open car end design. The design replaces the door between cars with an accordionlike connector in order to create longer, open spaces, allowing for greater passenger flow movement and increasing capacity in the process. These cars have become an international standard: in London, 31 percent of cars will be open car end by the end of the year; in Paris, the figure climbs to 37 percent; and in Toronto to 56 percent. Wider doors: The door width of the new cars will be expanded from the current MTA standard of 50 inches to 58 inches. Customer amenities and security: The interior of new cars will also include WiFi, USB chargers, full-color digital customer information displays, digital advertisements, illuminated door opening alerts and security cameras to promote passenger safety. Exterior features: Design elements for the exterior of the new subway cars include a new blue front with large windows, LED headlights and a blue stripe with gold accents along the sides. Cuomo also described his plan to create a new and improved design standard for subway stations and undertake extensive renovations at 31 stations from across the five boroughs. Some of the improvements include: enhanced lighting throughout the stations; improved signage to make it easier for customers to navigate stations, including digital, and real-time updates on on-time performance at subway entrances before customers even enter the station.